Description: Limited edition controller only available through Nintendo Power. 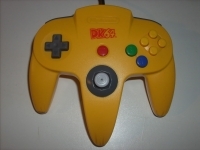 This is a list of VGCollect users who have Nintendo 64 DK64 Limited Edition Banana Yellow Controller in their Collection. This is a list of VGCollect users who have Nintendo 64 DK64 Limited Edition Banana Yellow Controller in their Sell List. This is a list of VGCollect users who have Nintendo 64 DK64 Limited Edition Banana Yellow Controller in their Wish List.